Stitching Memories Quilt Guild will present their 2012 quilt show, “Quilting on the Trail”, Friday, September 14th and Saturday, September 15th, at the Stephens County Fair & Expo Center, 2002 South 13th Street, Duncan, OK. The hours of the show will be Friday 9 AM – 5 PM, and Saturday 9 AM – 5 PM with a $5.00 admission for one day or $8.00 for two days. There will be approximately 150 beautiful quilts to view. with a Vendors’ Mall and a Quilters’ Look at our beautiful Wildflowers on the Trail raffle quilt (80″ x106″)! Our “Wildflowers on the Trail” raffle quilt (tickets are available from any guild member) will be awarded at the close of the show on Saturday, September 15, 2012. You do not need to be present for the drawing. The raffle quilt has been appraised by a certified AQS appraiser at a value of $1,900. Mercantile with many handmade items for sale. The “Wildflowers on the Trail” quilt pattern is a wonderful design from Julia Hale called “On Point”. This is a wonderful block of the month pattern and has an optional pieced center medallion or the hand-appliquéd chosen for our raffle quilt. The raffle quilt committee consisted of Colleen Pollock, Sharon Pulis, Kay Gray, Oley Alsobrook, Nonie Evans, and Gayle Schwartz. Additional helpers were Jackie Neely, Judy Irey, and Caroline McCarley. 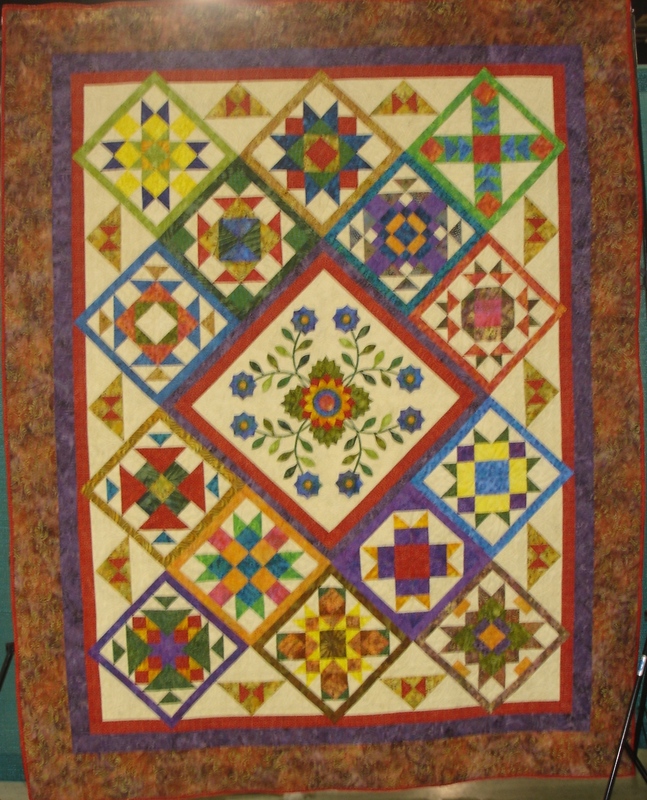 The center medalion was hand appliquéd by Nonie Evans. Longarm machine quilting was by Quilts by Gail, Chickasha, OK.
Special activities of the show will include a silent auction where some of our members’ best work will be showcased. Items will be changed every four hours throughout the quilt show. The Chuckwagon Tearoom will be serving brisket, potato chips, baked beans, pickle, and a drink for $6.00 from 11:00 am-2:00 pm each day. OHCE members will provide the desserts. More raffles will be done at this event. For more information regarding the quilt show, e-mail SMQG or call 580-656-3007.